Putting pieces into play. Not a lot happened, but they are ramping up. I'll have more to say when I stole reddit and podcast thoughts later. I liked all the reunions, but there were so many I couldnt remember who were reunited last season vs this season because almost every major character is at Winterfell now. I made this joke too! We saw Grey Worm along side Missandei when they rode into Winterfell, but he didn't have any lines. It definitely worked better than any other time we've tried GoT in VR. wags83 wrote: Source of the post We saw Grey Worm along side Missandei when they rode into Winterfell, but he didn't have any lines. That's right. Brienne was in the same caravan too I think. Theon saving Yara on the surface may have seemed like it was too easy, because that is the way it looked. 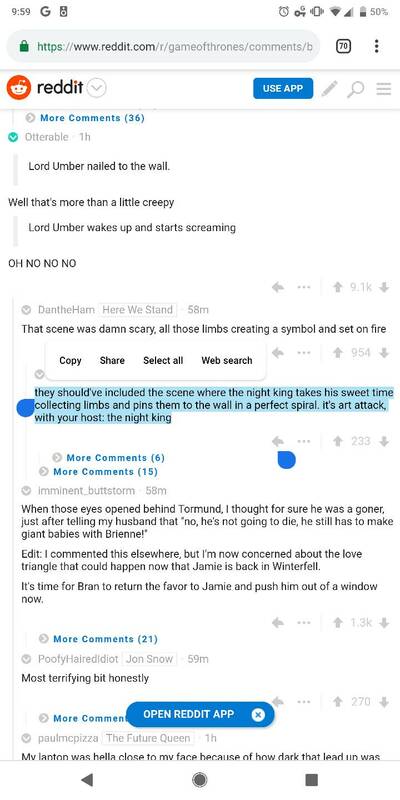 But if Theon timed it right, it would have been easy. Remember, Euron's crew all have their tongue's cut out, a point he boasts about to Cersei. So, no one can sound the alarm that the boat is being attacked. Move fast enough so that they can't mount a defense and boom, you have Yara safe and sound. My brother in law is convinced Cersei and Night King team up to take down Jon. Speaking of this, the first dude on the ship to be killed with an arrow through the eye was Rob McElhenney of It's Always Sunny in Philadelphia fame. I forget. Has anyone seen the ice dragon other than Bran and the guys up at the wall? Dany and Jon haven't? Tyler wrote: Source of the post I forget. Has anyone seen the ice dragon other than Bran and the guys up at the wall? Dany and Jon haven't? I should have waited to post. Podcast on my walk answered the question. They haven't seen it. The first Dany knew about it was when Bran said we have no time for this because they have the dragon. Dany really didn't react to that, but she also has no reason to believe Bran I guess? Podcast also pointed out something funny. Over the course of 7 seasons we have slowly seen the pieces put into place to have Jon, Dany, The Hound, Gendry, Tyrion, Varys, etc all end up at Winterfell. Ayra comes to Winterfell on her own after being alone for years. 2 days after being at Winterfell Jon, The Hound, Gendry all show up. 3 people who were very important to her. Her mind must be blown, but I guess Sansa probably filled her in on everything. Thirdly. Sansa is complaining about feeding the dragons when they don't have enough food for the men. The dragons probably eat as much as 500 men, but how many men would you trade to have 1 dragon? I think a single dragon is worth like 5,000 soldiers, probably way more. It's like asking if you would rather have a foot army or a WMD. Tyler wrote: Source of the post I should have waited to post. Podcast on my walk answered the question. They haven't seen it. The first Dany knew about it was when Bran said we have no time for this because they have the dragon. Dany really didn't react to that, but she also has no reason to believe Bran I guess? Ah, good point. I kinda forgot about that. Although Jon and others from the Wall/wildlings have seen how the Night King can raise things from the dead, so maybe they already assumed that's what would happen with the dragon. wags83 wrote: Source of the post so maybe they already assumed that's what would happen with the dragon. Tyler wrote: Source of the post Thirdly. Sansa is complaining about feeding the dragons when they don't have enough food for the men. The dragons probably eat as much as 500 men, but how many men would you trade to have 1 dragon? I think a single dragon is worth like 5,000 soldiers, probably way more. It's like asking if you would rather have a foot army or a WMD. Danerys was complaining about the dragons not eating enough. Maybe the dragons were going on a diet to be nice to the men. They're clearly saving room so they can eat the White Walker and Lannister armies.